Bulk SMS software for Windows mobile phone composes and sends thousands of text SMS over worldwide location from PC using Windows mobile phone. SMS gateway program sends text messages instantly from PC without requiring any internet connection. Now no need to type same text messages again and again, just installed bulk SMS software to your computer system and sends unlimited text SMS instantly over national or global mobile network. Event alerts and many more. ✔ Sends group text messages simultaneously: Bulk SMS software broadcast group text SMS to single or list of mobile users across the world in few easy steps. ✔ Delay delivery option: Windows mobile messaging program provides advanced delay delivery option to control load of bulk SMS while sending unlimited text messages over global mobile network. 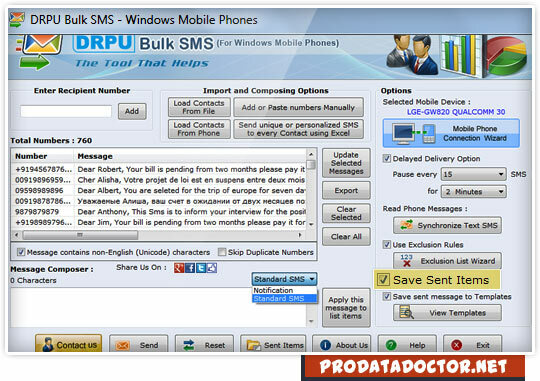 ✔ Skip duplicate contact number entries: PC to mobile SMS software provides option to skip duplicate contact number entries during bulk SMS sending process. ✔ Deliver notifications and standard SMS: SMS broadcasting program successfully delivers notifications and standard messages to your global mobile audiences from PC using Windows mobiles. ✔ Save sent SMS details: Group SMS sender software saves your sent text messages details to templates which can be easily viewed by users whenever requires.